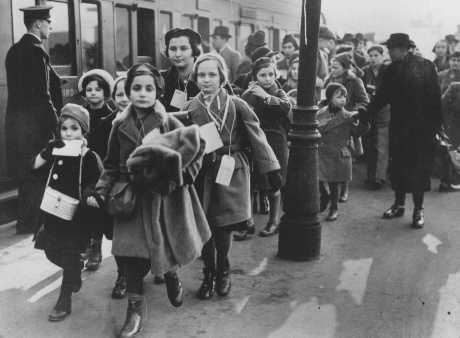 Austrian Jewish refugees, members of a Kindertransport, arrive at a London train station February 2, 1939. Five members have just resigned from the Second Generation Network (2GN), the network of British people whose parents were refugees from the Nazis. The five are the editor of the magazine, Second Generation Voices, a member of the 2GN committee, a long-standing former member of the committee who was also the editor of the magazine, and two other stalwarts. Most of the members are Jewish but the network is not just for Jews. It includes those whose parents fled for political reasons (or indeed any reason). The purpose of the 2GN has been ambiguous but has allowed its members to have a safe space to talk about their experiences, which are rarely well understood by people, however well-meaning, who do not share this very specific background. But the 2GN also has had an ‘educational’ function – there have been regular, if erratic, talks on issues of interest. But there has been some – usually not articulated – conflict between these two purposes as well as a bubbling subterranean tension about the degree to which 2GN really is a ‘Jewish’ organisation Both these tensions have almost certainly contributed to a dwindling membership. The events which precipitated our resignation lie in an article written by Yvonne (one of the resignees) to commemorate Holocaust Memorial Day (HMD). The tale is complex and involves two separate strands. The following is inevitably a simplification. In January 2012 Yvonne submitted an article on HMD that included an explanation of the stages leading towards genocide and a very brief reference—- just six words— to the curtailment of Palestinian rights in Palestine and the occupied territories. These six words were deleted by the committee, though agreed by the editor. Following objections, ‘it was agreed [by the committee] that Yvonne would write an article about Palestine for the next issue of 2GVoices and that ‘Jennifer [the Editor] …would not edit/stifle Authors’ voices as expressed by Yvonne, academic experts or other contributors’ (Minutes of 2GVoices Editorial Committee 30 January 2012). Yvonne wrote the article and the committee decided not to publish it, again against the wishes of the editor. This systematic censorship would be bad enough but there was also a failure to explain what was happening— throughout this process the committee failed to consult with or even inform Yvonne or the editor of their decisions. Insofar as there was an explanation offered by the Voices Committee, it was that the 2GVoices does not take sides in the Israel/Palestine conflict. But in reality,as readers of 2GVoices will know, 2GVoices has published articles and letters on both Israel and Palestine. Indeed, in the very issue that Yvonne’s article was censored, there was a strongly pro-Zionist letter by another reader. So one ground for our resignation is that the committee is exercising censorship, and censorship in particular of views which are unfavourable to Israel. The second issue is one of exclusion. Since last May, Yvonne, the editor and a few others have tried repeatedly to meet with the committee or a sub-group of the committee to try to find a resolution. By now, we had become exceedingly annoyed by the political censorship and the failure of the committee to even discuss the issues with us. We advised them that if they did not agree to publish Yvonne’s article in some form in the next issue of 2GVoices, we would resign. When the committee did meet Yvonne and one other on 26 June 2012, they told them that our, the protestors’, intention was to resolve this matter amicably. The committee chose not to negotiate. Yvonne’s article will not be carried and we have all now resigned. What lies behind this split? The issues are intertwined. We, the 2G, all come from a past where our parents were forced to flee for their lives and where the issue of exclusion is one we are especially sensitive to. We do not expect to experience exclusion at the hands of our ‘fellows’. But why did the committee in effect exclude us? I have two suggestions. Firstly, the 2GN’s membership is now only just over 100 and one feature of shrinking groups (as many of us know from other political experiences!) is that they turn inwards on each other. The second issue is that a ‘soft’ pro-Zionism has become increasingly legitimate, both within the 2GN but also as part of the dominant political discourse in Britain (and the US), so that even mild criticism of Israel is seen as ‘outside the box’ and not tolerable. We are however hoping to set up a website for discussion of issues relating to all Second Generation descendants of refugees from Nazi-occupied Europe and also to members of other Second Generation groups and we invite everybody to contribute as soon as we have done so. This article follows on from Yvonne Gordon’s article Holocaust Memorial Day: Speak Up, Speak Out, in the last issue of Second Generation Voices (49), and addresses speaking up and speaking out about what is happening in Palestine/Israeli-Occupied Territories and the conditions imposed by Israel upon the Palestinians in that region. A good source of information is B’Tselem, The Israeli Information Centre for Human Rights in the Occupied Territories. B’Tselem has championed human rights in the West Bank and Gaza Strip for over two decades, promoting a future where all Israelis and Palestinians will live in freedom and dignity. Yvonne Gordon’s mother was born in Kanth, near Breslau in Germany (now Wroclaw, the capital of Lower Silesia in Poland), where her father was a GP. She came to England in 1939, aged 18, to work as a domestic. The only surviving member of her family, her parents and younger sister perished in Auschwitz. Yvonne’s late father was born in Hildesheim, near Hanover in Germany, in 1916. Beaten up by the Nazis, he came to England via France in 1937, and was interned first on the Isle of Man and subsequently in Canada. He never recovered from the trauma. As a Second Generation member I feel it is particularly relevant that we, the Second Generation, are sensitive to the victimisation of other groups and do not follow the philosophy of ‘justifiable revenge’ for the suffering of our forebears. This article takes the example of the Palestinians who are blanketed by some Zionists as ‘justifiably oppressed’ under the ‘Israel can do no wrong’ banner. This article does not purport that the conduct of Palestinians is squeaky clean, far from it. All it seeks to do is to give some examples of Israeli abuses of Palestinians to redress the anti-Palestinian bias sometimes shown by some Zionists and supporters of Zionism. As Second Generation we need to take care not to set ourselves and our forebears up as having the monopoly on suffering and consequently feeling that oppressive retaliation is justified. Actions do not need to lead to deaths to be considered to be acts of genocide – causing serious bodily or mental harm or the deprivation of resources such as clean water, food, shelter or medical services can be regarded as inflicting conditions of life calculated to bring about physical destruction. The issue of what is happening in Israel and Palestine is a very emotive subject, specially for those of us who are members of the Second Generation. Although difficult, I feel it is important that we try to look at the evidence objectively and try not to be limited by preconceived views and opinions. The Editorial Committee do not all sing from the same ‘psalm’ sheet and neither do we, the Second Generation. I feel strongly that censorship (including self-censorship) should be avoided. We need to ‘Speak Up and Speak Out’, the theme of this year’s HMD. There are many alternative Jewish voices not only in the UK (as is clear from the over 1600 signatories in the British-based Jews for Justice for Palestinians movement but also in Israel and indeed world-wide, who do not support the actions of Israeli carte blanche. There is nothing wrong with healthy debate and differing views, views should be expressed and facts presented, and readers left free to make up their own minds. In my view 2GVoices can and should provide a spectrum of opinion across the board from all the diverse Voices of the Second Generation. I am NOT saying that genocide is occurring in Palestine, just that conditions are being created for a potential genocide, specifically: “causing serious bodily or mental harm or the deprivation of resources such as clean water, food, shelter or medical services (such as is happening in Palestine**)”, the words within brackets are my addition and some referenced examples (of which there are many more to be found on the internet) are given at the end of this article. It is not just my opinion that Palestine is potentially in a genocide situation. The ‘deprivation of resources’ is listed on the HMD website as a ‘potential’ situation that could lead to genocide; it is very interesting, however, that nowhere on the HMD website is Palestine actually mentioned. ‘Palestinians in Gaza/West Bank’ and ‘Israeli Palestinians’ are explicitly listed in Peoples Under Threat 2011 on the Genocide Watch website. Given that the theme of HMD this year is to ‘Speak Up and Speak Out’ it is vital that everyone – reader and writer alike – can do exactly this. If not, we are surely on the same level as those whom we see as the oppressors. We become both oppressors and victims ourselves if we silence those whose views differ from our own, or if we are too frightened to speak or publish in case we offend someone. These were originally presented as a briefing paper at the US State Department in 1996, by the website’s founder, Dr Gregory Stanton. Palestine is classified as being in a state of polarisation, which is defined as: “Extremists drive the groups apart. Hate groups broadcast polarising propaganda. Laws may forbid intermarriage or social interaction. Extremist terrorism targets moderates, intimidating and silencing the centre. Moderates from the perpetrators’ own group are most able to stop genocide, so are the first to be arrested and killed. Prevention may mean security protection for moderate leaders or assistance to human rights groups. Assets of extremists may be seized, and visas for international travel denied to them. Coups d’état by extremists should be opposed by international sanctions.” An example simply of one of these is a discriminatory Israeli law relating to marriage and citizenship (Ha’aretz: and Wikipedia). Olives comprise 25% of the total agricultural production in the West Bank. Along with their by-products, olives are one of the most robust elements of the Palestinian economy. This income source is being targeted ruthlessly and is the focus of a concerted campaign by Israel to force Palestinians off their land, in the process degrading and demoralising them. Palestinian farmers have had their lands stolen, crops set on fire, trees uprooted, and farms fenced-off beyond their reach and bricked up behind the Separation Wall, etc. Orchards have been razed to make way for the building of ever more illegal settlements and racist settler-only roads, as well as to make way for the continued construction of the illegal “apartheid” wall and also and simply to grab more Palestinian land (Middle East Monitor ). ‘There are currently 121 Israeli settlements and approximately 102 Israeli outposts built illegally on Palestinian land occupied militarily by Israel since 1967 (West Bank, East Jerusalem and the Golan Heights). The largest of the illegal settlements is Modi’in Ilit, with a population of 46,245 as of 2009’ (The Council for European Palestinian Relations). Settlements are the cause of great inequalities in access to natural resources between Israelis and Palestinians. Many settlements are built on prime agricultural land confiscated from Palestinians, or on key water resources such as the Western Aquifer basin, springs and wells. Israeli West Bank settlers consume an amazing 280 litres of water per day per person compared with 86 litres per day available for Palestinians in the West Bank – only 60 litres of which are considered potable [drinkable, Ed]. The World Health Organization recommends a minimum of 100 litres of water per person per day – meaning that settlers use far more than double the water required, whereas Palestinians do not even approach the minimum. ‘Israel’s Knesset (parliament) is due to hold a special session on Wednesday [20 April 2012, Ed] to discuss a bill which would authorise Jewish settlers to build on private Palestinian land, especially in the Migron settlement outpost and other such places. All Jewish settlements, “outposts” or not, are illegal under international law. That the Israeli parliament even gives time to debate such a law is a strong indication of the contempt in which it holds international laws and conventions, and the international community at large ‘ (Middle East Monitor). The roads are designed to provide alternative routes to connect Palestinian communities, often by upgrading circuitous dirt tracks or by building tunnels under existing routes( Jonathan Cook Al-Jazeerah). ‘A recent report by a group of 20 aid agencies has drawn public attention to one of the little reported aspects of the continuing conflict between Israel and the Palestinians – checkpoints and roadblocks in the West Bank and Gaza. The report said that these travel restrictions – some of them in place since the beginning of the intifada in 2000 – limit Palestinians’ access to schools and medical care, increase frustration and destroy hopes for peace. Israel says the measures are vital to stop suicide bombers flooding into its cities to terrorise the civilian population. However, the army has periodically eased travel restrictions, for example during the three-month ceasefire by Palestinian militants in summer 2003. The restrictions range from unguarded earth-and-concrete barriers to complex military checkpoints where documents can be inspected and people and vehicles searched (BBC News). Most of the checkpoints in the West Bank are not located on the boundary between Israel and the occupied Palestinian territory, but rather throughout the West Bank . Ongoing dialogue between people of all shades of opinion is one of the best ways of standing up and speaking out against discrimination, persecution and prejudice.